Abstract: Bone grafting is beneficial in enhancing bones that are lost due to trauma or natural or pathologic process. Autogenous bone, allogenic bone, xenogeneic bone, bone substitutes, and alloplasts can also be used for this purpose. Bone quantity should be adequate for the placement of implants, which necessitate the use of bone grafts before implant placement. 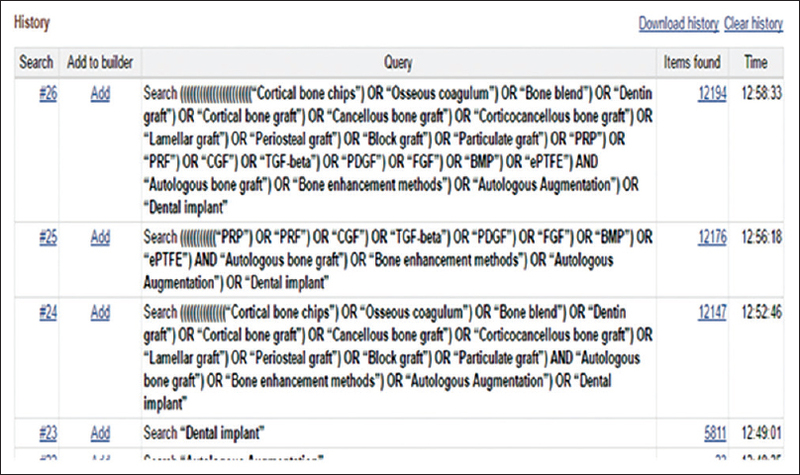 Objective: This review analyses the different bone graft materials that are used for grafting around implants and evaluate if these grafts yield successful implant osseointegration over a period of time. Materials and Methods: The MEDLINE–PubMed database was searched from September 2016 to 10 years previously. Several journals were hand searched and from cross-references. The primary outcome measure that was analyzed was the survival rate of dental implants in the grafted sites at 6 months–1 year, and the secondary outcomes were success rates of dental implants over a period of 3–5 years’ follow-up. Results: The search yielded 213 articles. Ultimately, 31 studies meeting the eligibility criteria were selected. 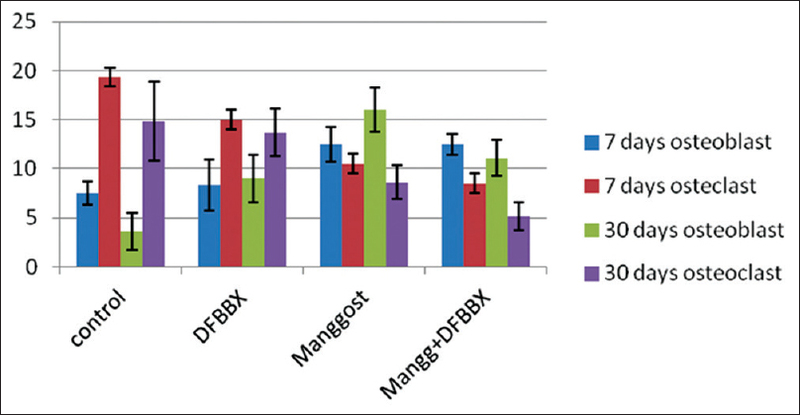 The analysis shows that autologous bone grafts can be preferred over allografts and xenografts for grafting implant sites, which showed less complication and high success rate. Conclusion: Based on the available data in the current existing studies with a follow-up period of at least 3–5 years, it can be summarized that the autologous bone grafts can be preferred over allografts and xenografts for grafting implant sites since they are stable for at least 3–5 years. Purpose: Occlusal plane (OP) differs considerably in participants with skeletal Class I and Class II participants. 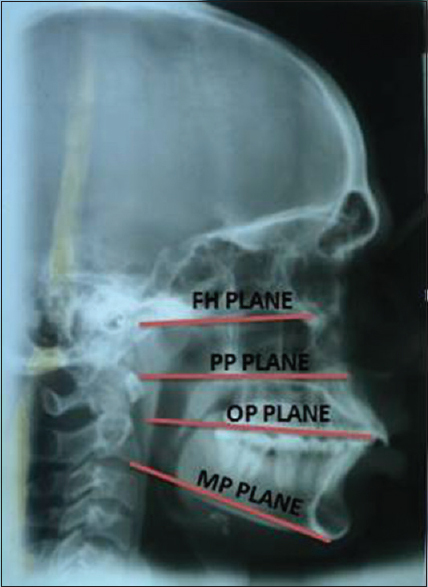 In this study, cephalometrics has been used to help in the determination of orientation of the OP utilizing the nonresorbable bony anatomic landmarks in skeletal Class II participants and an attempt has been made to predict and examine the OP in individuals with skeletal class II jaw relationship. Materials and Methods: One hundred dentulous participants with skeletal Class II malocclusion who came to the hospital for correcting their jaw relationship participated in the study. Their right lateral cephalogram was taken using standardized procedures, and all the tracings were manually done by a single trained examiner. 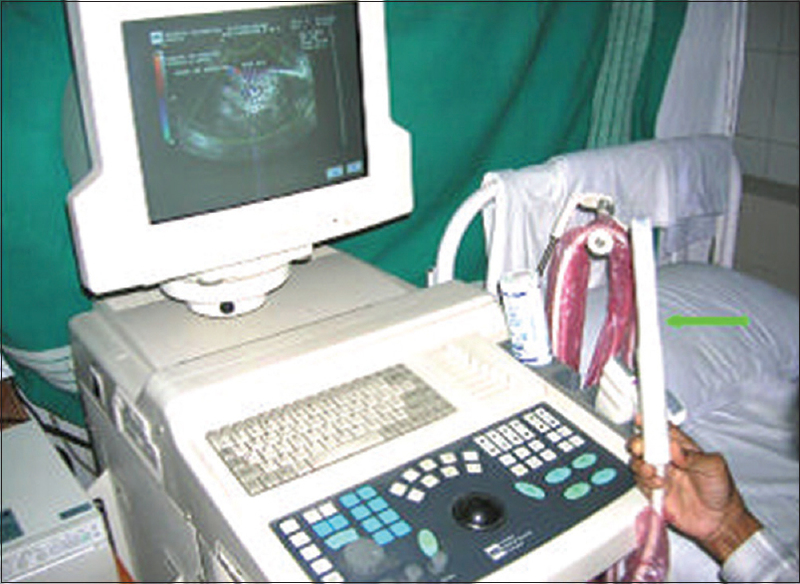 The cephalograms which were taken for the diagnostic purpose were utilized for the study, and the patient was not exposed to any unnecessary radiation. The numerical values obtained from the cephalograms were subjected to statistical analysis. Pearson's correlation of <0.001 was considered significant, and a linear regression analysis was performed to determine a formula which would help in the determination of orientation of the OP in Class II edentulous participants. Results: Pearson's correlation coefficient and linear regression analysis were performed, and a high correlation was found between A2 and (A2 + B2)/(B2 + C2) with “r” value of 0.5. A medium correlation was found between D2 and (D2 + E2)/(E2 + F2) with “r” value of 0.42. The formula obtained for posterior reference frame through linear regression equation was y = 0.018* × +0.459 and the formula obtained for anterior reference frame was y1 = 0.011* × 1 + 0.497. It was hypothesized that by substituting these formulae in the cephalogram obtained from the Class II edentate individual, the OP can be obtained and verified. Conclusion: It was concluded that cephalometrics can be useful in examining the orientation of OP in skeletal Class II participants. Purpose: Soft liners act as a cushion between the denture base and the residual ridge. Hence, it is important to study their effect on resorption of mandibular denture bearing area. Therefore, the purpose of this study was to evaluate the influence of soft denture liner on mandibular ridge resorption after 1 year in completely denture wearers. 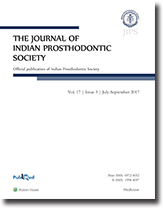 Materials and Methods: Twenty-eight completely edentulous patients having age between 45 and 60 years with well-formed ridges in class I jaw relations were selected as per the inclusion and exclusion criterion. 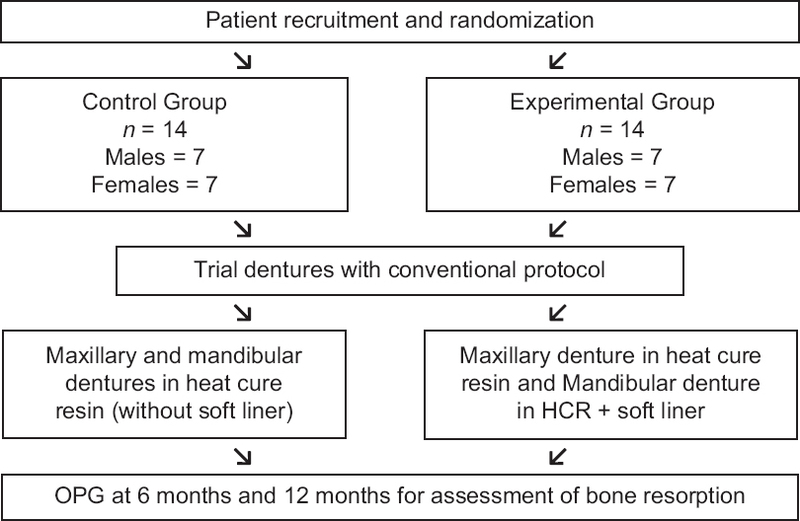 Randomization chart was used to enroll participants in experimental and control groups who were given mandibular dentures with and without soft denture liner, respectively. Vertical measurements were made on orthopantomograph and analyzed using Adobe Photoshop 7.0 software at five points, i.e., one at central incisor and two points at right and left first premolars and two in each first molar region. 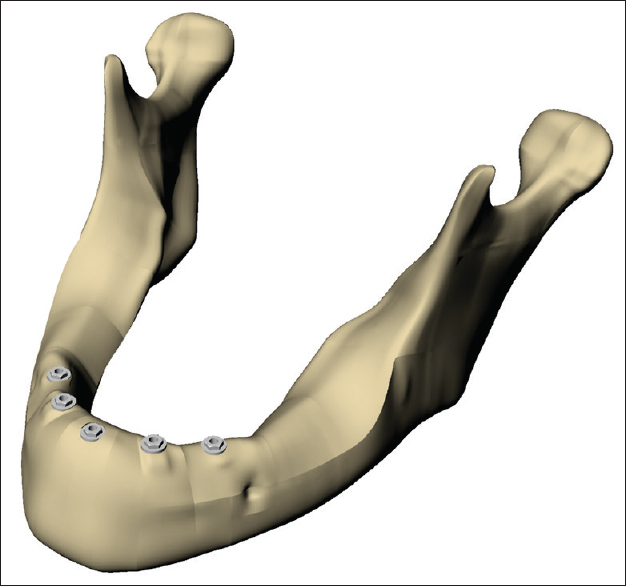 Results: On application of repeated measures analysis of variance, both groups showed a significant change in bone height after denture delivery (P < 0.05). Intergroup comparison (Wilcoxon rank sum test) of bone height in different regions at various time intervals showed statistically significant difference in bone levels (P < 0.05) from baseline to 6 months and baseline to 12months (P < 0.01), while the difference was statistically not significant during 6 and 12 months’ period. Conclusion: The use of soft denture liner significantly reduces the residual ridge resorption in complete denture wearers as compared to conventional denture wearers (without denture liner) over a period of 1 year. Introduction: Our study's objective was to compare resistance to fracture between endocrown and conventional post and core restorations when subjected to shear force. Materials and Methods: Thirty human mandibular premolars were extracted for orthodontic reasons, endodontically treated, and restored using three different methods: endocrown, glass fiber post and composite resin core, and metal post. All the crowns were made from IPS e.max ceramic. Shear forces were applied to these restorations using a test machine until breakage. Load and displacement were recorded every 0.1 s. Results: No significant difference was observed in resistance to fracture between glass fiber post and metal post. No relationship between the displacement of prosthetic dental system and type of material used was uncovered and by comparing the type of fracture with the restoration material used. However, a greater number of favorable fractures were observed in the glass fiber group whereas most of the fractures in the endocrown and metal post groups were unfavorable. Conclusion: Endocrown displays better resistance to fracture compared to conventional post and core restorations. In addition, endocrown did not show more displacement or cause more unfavorable fractures than the conventional restorations. This restoration may represent a reliable alternative for restoring a damaged, endodontically treated tooth. Purpose: The purpose of the study was to assess and compare the occlusal contacts in dentate and edentulous patients wearing complete denture with varying head posture. Materials and Methods: Ad hoc sampling of 30 subjects (15 dentate and 15 edentulous) based on inclusion and exclusion criteria was done. Subjects were divided into two groups: dentate and edentulous. Each group was further divided into two subgroups based on two head postures-upright 90° and ventroflexed 30°. For recording of every posture, a new sensor was used, and the subject was asked to clench on the sensor in maximum intercuspation position at the two head postures. Results: Data were summarized as mean ± standard error and compared by Student's t-test using SPSS software (windows version 17.0 IBM corporation, New York, USA). A statistically significant correlation between head posture and contact area was found in dentate and denture wearers, i.e., tooth contact area varies with head posture. Conclusion: It was concluded that the occlusal contacts vary at different head posture in dentate as well as in denture wearers. 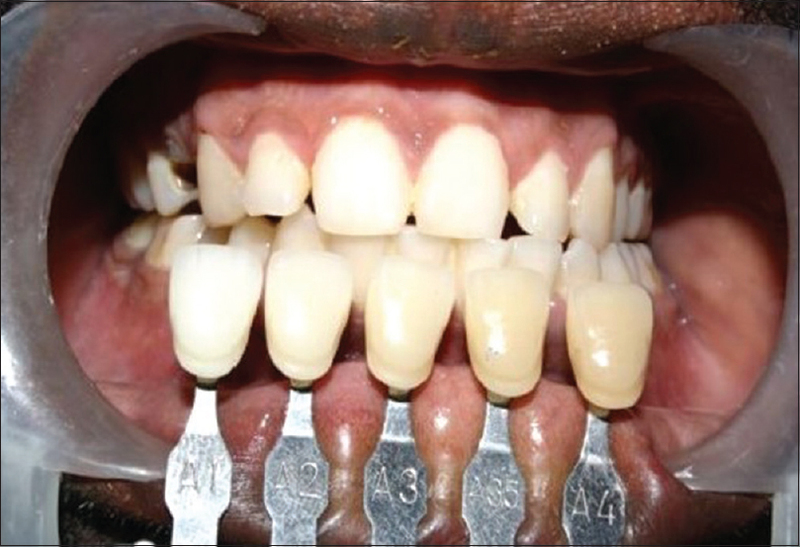 With ventroflexion, the number of tooth contact decreased as compared to upright-erect position in both groups. Clinical implication - since the number of tooth contacts varies with varying head postures, it is recommended that the balancing of the contacts should be done at varying head postures. Background: The increase of requests for implant-supported prosthesis (ISP) with zirconia as infrastructure has attracted a lot of attention due to its esthetics, biocompatibility, and survival rate similar to metallic infrastructure. The aim of this study was to evaluate the influence of two different framework materials on stress distribution over a bone tissue-simulating material. Materials and Methods: Two ISP were modeled and divided into two infrastructure materials: titanium (Ti) and zirconia. Then, these bars were attached to a modeled jaw with polyurethane properties to simulate bone tissue. An axial load of 200 N was applied on a standardized area for both systems. Maximum principal stress (MPS) on solids and microstrain (MS) generated through the jaw were analyzed by finite element analysis. Results: According to MS, both models showed strains on peri-implant region of the penultimate (same side of the load application) and central implants. For MPS, more stress concentration was slightly higher in the left posterior region for Ti's bar. In prosthetic fixation screws, the MPS prevailed strongly in Ti protocol, while for zirconia's bar, the cervical of the penultimate implant was the one that highlighted larger areas of possible damages. Conclusions: The stress generated in all constituents of the system was not significantly influenced by the framework's material. This allows suggesting that in cases without components, the use of a framework in zirconia has biomechanical behavior similar to that of a Ti bar. Aims: The aim of this study was to evaluate and compare the shear bond strength of porcelain to the alloys of nickel-chromium (Ni-Cr), cobalt-chromium (Co-Cr), and titanium. Materials and Methods: A total of 40 samples (25 mm × 3 mm × 0.5 mm) were fabricated using smooth casting wax and cast using Ni-Cr, Co-Cr, and titanium alloys followed by porcelain buildup. 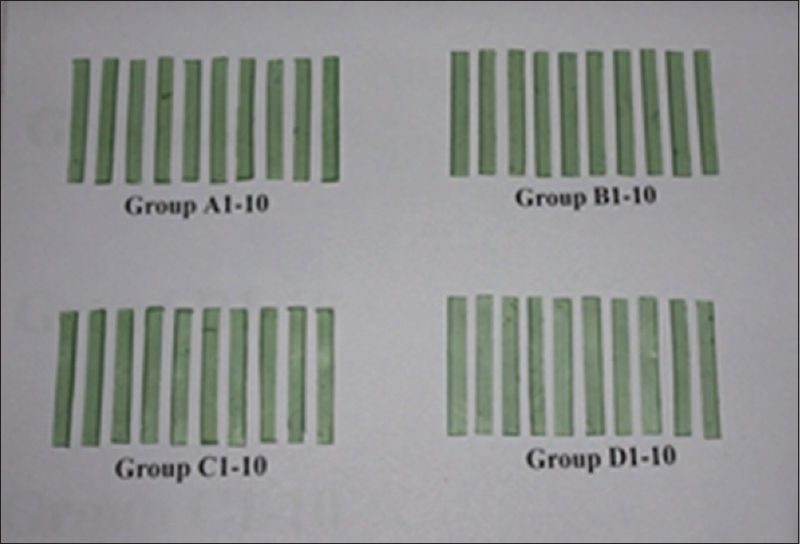 The samples were divided into four groups with each group containing 10 samples (Group A1–10: sandblasted Ni-Cr alloy, Group B1–10: sandblasted Co-Cr alloy, Group C1–10: nonsandblasted titanium alloy, and Group D1–10: sandblasted titanium alloy). Shear bond strength was measured using a Universal Testing Machine. Statistical Analysis Used: ANOVA test and Tukey's honestly significance difference post hoc test for multiple comparisons. Results: The mean shear bond strength values for these groups were 22.8960, 27.4400, 13.2560, and 25.3440 MPa, respectively, with sandblasted Co-Cr alloy having the highest and nonsandblasted titanium alloy having the lowest value. Conclusion: It could be concluded that newer nickel and beryllium free Co-Cr alloys and titanium alloys with improved strength to weight ratio could prove to be good alternatives to the conventional nickel-based alloys when biocompatibility was a concern. Objectives: Since time immemorial, plants have continued to play a predominant role in the maintenance of human health as sources of medicinal compounds. Several effective antifungal agents are available for oral Candida infections; the failure is not uncommon because isolates of Candida albicans may exhibit resistance to the drug during therapy. The present study aimed to identify an alternative, inexpensive, simple, and effective method of preventing and controlling the candidal infection. Methodology: All the procured and authenticated nutmeg seeds were dried in shade and cleaned by hand sorting. The crushed seeds were passed through mesh no. 40 individually. About 50 g of powdered nutmeg seeds was loaded in the supercritical fluid extractor unit using supercritical CO2 as extracting solvent in accordance with the methods of Nguyen et al. Supercritical fluid (SFE) extraction was done using CO2 gas without any cosolvents. Results: The nutmeg extract displayed antifungal activity with the effective zone of inhibition ranging from 18.0 to 12.0 mm when compared with nystatin as positive control. Conclusion: This paper described the in vitro antibacterial activity, and phytochemical analysis of SFE extract of nutmeg (Myristica fragrans) evaluated against C. albicans (American Type Culture Collection 10231) through agar well diffusion method. SFE of nutmeg seeds can be used as an adjunct to conventional therapy for oral candidiasis. Aim: This study aimed to compare three different methods used for shade selection, i.e., visual method, spectrophotometer, and digital photography method. Materials and Methods: Fifty participants were selected from the Out Patient Department of Prosthodontics. Presence of the maxillary right central incisor with no history of any restorative or endodontic procedures was the primary inclusion criterion. The shade of the right maxillary central incisor was determined using all the three shade selection procedures, namely, visual, spectrophotometric, and digital photography method for all the selected participants. The shades obtained in the visual method using a shade guide were noted down for further comparisons. The spectrophotometer reported the L*, a*, and b* values along with the actual shade whereas the digital photography method reported only the L*, a*, and b* values. The agreement between the readings obtained by the three different methods was compared and subjected to appropriate statistical analysis. Results: The results showed that when the three methods studied were compared, there was a statistically significant proportion of agreement between spectrophotometric and visual method (P < 0.01) with higher proportion of “yes” (agreement) and between the spectrophotometric and digital photography method (P < 0.01) with higher proportion of “yes” (agreement). Coefficient of agreement (using Kappa coefficient) between spectrophotometric and visual shades revealed a fair agreement. The mean ΔE was 1.69. There was a statistically significant difference between the proportion of ΔE more than and <2, between spectrophotometric and digital photography methods (P < 0.01) with higher proportion of <2 ΔE. Furthermore, percentage of agreement between shades obtained by the visual and spectrophotometric method showed maximum agreement with A1 shade. Conclusion: It was concluded that the digital photography method emerged as a reliable method for shade selection in a clinical setup. Background: Following the extraction of a tooth, bone resorption can cause significant problems for a subsequent denture implant and restorative dentistry. Thus, the tooth extraction socket needs to be maintained to reduce the chance of any alveolar ridge bone resorption. Objective: The objective of this study is to determine whether the administration of mangosteen peel extracts (MPEs), combined with demineralized freeze-dried bovine bone xenograft (DFBBX) materials for tooth extraction socket preservation, could potentially reduce inflammation by decreased the expression of nuclear factor κβ (NfKb) and receptor activator of nuclear factor-κβ ligand (RANKL), to inhibit alveolar bone resorption, and increased of bone morphogenetic protein-2 (BMP2) expressions to accelerate alveolar bone regeneration. Materials and Methods: This study consists of several stages. First, a dosage of MPE combined with graft materials was applied to a preserved tooth extraction socket of a Cavia cobaya. Second, the C. cobaya was examined using immune histochemical expression of NfKb, RANKL, BMP2, as well as histology of osteoblasts and osteoclasts. The research was statistically analyzed, using an analysis of variance test and Tukey honest significant difference test. Results: The results of this research were that it was determined that MPEs combined with graft materials on a preserved tooth extraction socket can reduce NfKb, RANK, and osteoclasts also increase of BMP2 and osteoblast. Conclusion: The induction of MPEs and DFBBX is effective in reducing inflammation, lowering osteoclasts, decreasing alveolar bone resorption, and also increasing BMP2 expression and alveolar bone regeneration. Aims: To determine the influence of hard acrylic denture base materials on the blood flow of mandibular denture supporting mucosa over a period of six months time. Materials and Methods: Select fifteen edentulous patients of age 55-75 years. The blood flow of the mandibular denture supporting mucosa was measured bilaterally in the molar region and in the incisor region utilizing Ultrasound colour Doppler (2D and Duplex Imaging). Measurements were performed prior to denture insertion and later after the dentures were worn for 1 month, 2 months, 3 months, 4 months, 5 months and 6 months. Statistical analysis used: Mean blood flow as measured by Ultrasound colour Doppler were tabulated significant changes if any at various time interval in comparison to baseline was assessed by Kruskalwallis ANOVA test followed by Wilkoxan sign rank test for pairwise comparison. ( In the present study, P < 0.05 was considered as the level of significance). Results: The denture supporting mucosa exhibited a progressive reduction in the blood flow both with hard denture. The blood flow change with hard denture was a reversible condition as the blood flow improved at the end of six months. Kruskalwallis ANOVA test revealed no significant change in the blood flow at any interval of time in comparison to base value (P = 0.133). Conclusions: Within the limitations of the study denture supporting mucosa exhibited a progressive reduction in the blood flow with hard denture which was reversible. Aim: A comparative study for plaque removing efficacy between toothpaste, liquid handwashing soap, and two chemical-soak denture cleansers (clinsodent denture cleansing powder and fittydent denture cleansing tablet). Materials and Methods: A total of 140 healthy complete denture patients were selected and checked for denture cleansing using toothpaste, liquid handwashing soap, and two chemical denture cleansers: Clinsodent powder and fittydent tablets. Cleansing with plain water was kept as control for twenty patients. Results: The data were analyzed using Wilcoxon signed ranks test for checking the efficacy. The Kruskal–Wallis test was used for comparing the plaque removing efficacies of each denture cleanser used in the study. All four denture cleansers were significantly effective in removing plaque when compared with plain water, but there was no significant difference among them. Conclusions: There was no significant difference among action of four denture cleansers used in this study. Thus we can infer that patients can use liquid handwashing soap or commercial products to overcome disadvantages of toothpastes. Recommendation from the results of this study is the use of liquid handwashing soap for cleansing after every meal and soaking of the denture in commercial denture cleanser during the night. Aim: The purpose of the study was to evaluate the fracture strength of provisional fixed partial dentures made of autopolymerizing polymethylmethacrylate (PMMA) resin using different types of reinforcement materials to determine the best among them. Materials and Methods: Fifty samples were made (10 samples for each group) with autopolymerizing PMMA resin using reinforcement materials (stainless steel wire: looped and unlooped and glass fiber: loose and unidirectional) as 3-unit posterior bridge. The test specimens were divided into five groups depending on the reinforcing material as Group I, II, III, IV, and V; Group I: PMMA unreinforced (control group), Group II: PMMA reinforced with stainless steel wire (straight ends), Group III: PMMA reinforced with stainless steel wire (looped ends), Group IV: PMMA reinforced with unidirectional glass fibers, and Group V: PMMA reinforced with randomly distributed glass fibers. Universal testing machine was used to evaluate and compare the fracture strength of samples. Comparison of mean ultimate force and ultimate stress was done employing one-way analysis of variance and Tukey's post hoc tests. Results: The highest and lowest mean ultimate force and mean ultimate stress were of Group IV and I, respectively. Tukey's post hoc honestly significant difference multiple comparison for mean ultimate force and stress shows the increase in strength to be statistically significant (P < 0.05) except for the samples reinforced with randomly distributed glass fibers (P > 0.05). Conclusion: Unidirectional glass fibers showed the maximum strength, which was comparable to mean values of both stainless steel wire groups. Low cost and easy technique of using stainless steel wire make it the material of choice over the unidirectional glass fiber for reinforcement in nonesthetic areas where high strength is required. 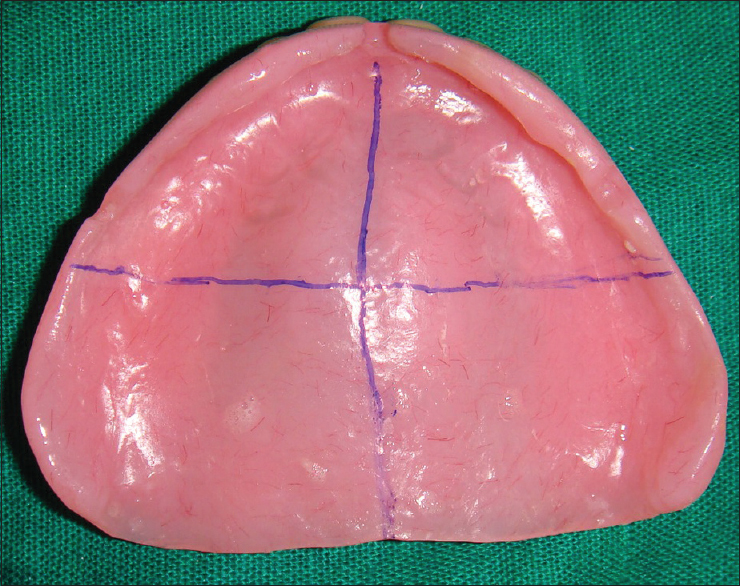 Increased patient acceptance and widespread use have led to a greater demand for refabrication of existing maxillofacial prostheses exhibiting wear and tear. Refabricating an osseointegrated implant-retained silicone auricular prosthesis on the existing Hader bar is a challenging task if it is performed without removing it. 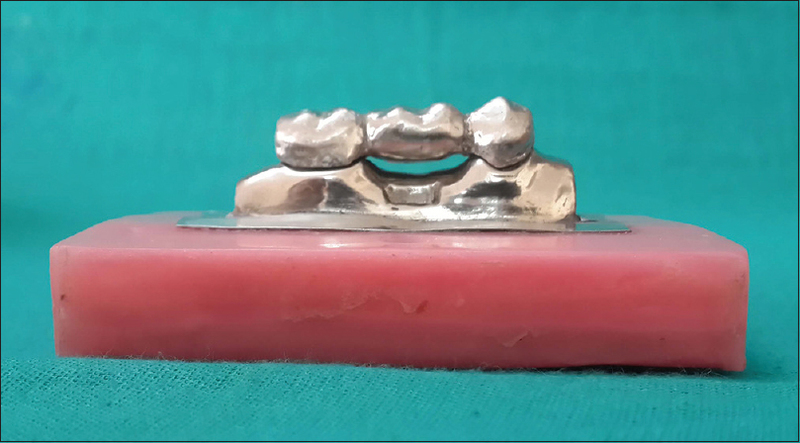 Therefore, an attachment level impression method is utilized for the refabrication of a new prosthesis on an existing Hader bar framework without removing it from the patient's defect. This case report discusses a modification of the Mahidol University technique. This modification provides a simple, speedy, and convenient method through which the relation between the metal framework and attachments could be obtained precisely. 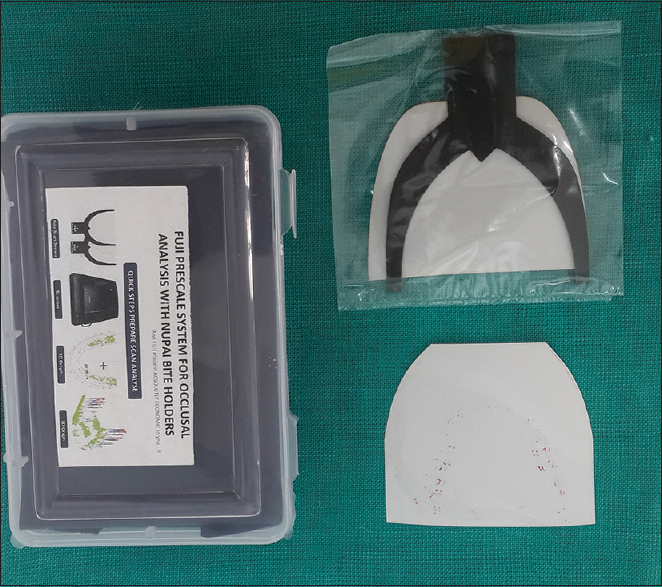 This precision allowed for easy fabrication of the acrylic housing, which in turn results in better adaptation of the auricular prosthesis to the patient's face. Therefore, this technique offers advantages to both the prosthetist in fabrication and the patient in facilitating him continue to wear his existing implant-retained prosthesis during refabrication process.